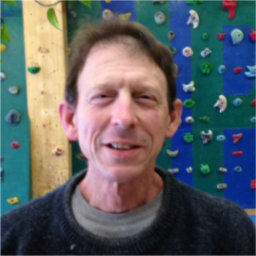 I got into climbing when I met Pat Bates and came climbing at Spirit Rock with Pat’s buddy pass. At my age, I appreciate that climbing keeps me loose and limber. I am happy to be climbing and I get a lot out of it. There are about a dozen of us seniors who climb regularly at Spirit Rock, and there are 6 artificial hips between us. 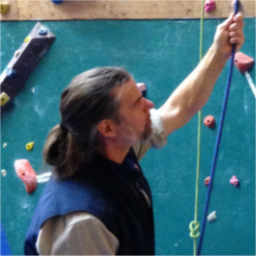 Climbing is excellent physiotherapy for us, encouraging mobility in a fun, social way. 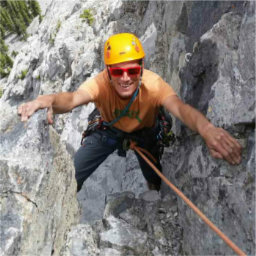 Bob is an excellent coach and he points out all kinds of ways for me to improve, and to focus on climbing easy and moderate routes with great technique and less effort. Unlike seasonal activities, you can climb 12 months of the year. I always feel better after climbing! I enjoy working with both youngsters and adults in climbing programs, it is a lot of fun to relate to them and coach them.